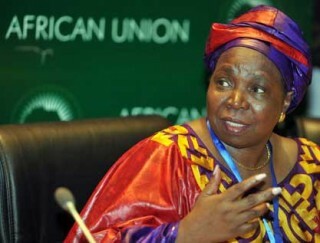 South Africa’s Nkosazana Dlamini-Zuma has become the first woman to head the African Union (AU). She was elected earlier this month in a six-month leadership contest that saw her beat incumbent Mr Jean Ping, from Gabon. Dr Dlamini-Zuma, the former wife of the South African President Jacob Zuma, gained the 60% of votes she needed from the 54-nation bloc at an AU Summit in Addis Ababa, Ethiopia. The election victory was far from easy. According to the Irish Times, it took eight months of behind the scenes lobbying and two separate elections for her to secure the majority she needed. The election also highlighted tensions between African Union countries, with Francophone countries backing Ping and Anglophone countries supporting Dlamini-Zuma. Dlamini-Zuma now faces the task of “unifying the African-Union” according to Dirk Kotze of the University of South Africa. Alex Vines of the British Think Tank Chatham House said she will “have to focus on rebuilding relationships, especially with a number of francophone states”, adding that her election was “highly significant” because it would strengthen South Africa’s position on the continent. However, that is not how Dlamini-Zuma sees things. “South Africa is not going to run the AU. It is Dlamini-Zuma who is going to come to make a contribution” she said after her win. Dlamini-Zuma comes to the job with an impressive track record. She was a minister in her native South Africa, boasting more time in government than her former husband, the President. She held health and foreign office posts and, more recently, a post within the home affairs ministry where she was credited with successful reforms. She joins a number of African women appointed or elected to leadership positions in Africa: Joyce Banda, elected the first female President of Malawi; Ellen Johnson Sirleaf, the current President of Liberia, Fatou Bensouda of Gambia, who was appointed the Chief Prosecutor of the International Criminal Court (ICC) and Mariam Aloma Muktar who became the first woman Chief of Justice in Nigeria. The Woman’s League of the ruling ANC in South Africa welcomed her appointment, saying that it “speaks volumes for the gains made in fighting patriarchy on the African continent”.